Colorado celebrates autumn with golden hillsides of aspen, scrub oaks in hues from crimson to burnt umber – and, the occasional dusting of snow on the high peaks. No season is more colorful for a scenic train ride – narrow or standard gauge. Many of the railroads offer special events during the fall. All aboard! Cumbres and Toltec Scenic Railroad – This popular excursion weaves along the Colorado/New Mexico border. Special fall events include the Moonlight Dinner Train on September 24 featuring a catered dinner and a classic murder mystery presented by Adams State College. On September 30th the Galloping Goose #5 makes its Fall Colors Classic run. 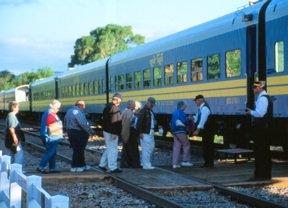 The scenic railroad has scheduled trips through October 17, 2010. 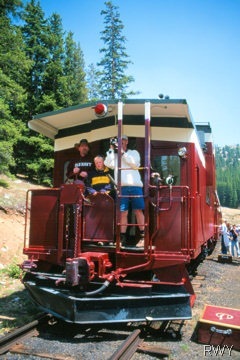 Manitou and Pikes Peak Railway – Scale Pikes Peak on the world’s highest cog railroad. The three-hour round trip to the 14,110’ summit qualifies as the most relaxed climb up the well-known mountain. Swiss diesel locomotives ratchet bright red cars filled with tourists up slopes with grades as high as 25%. Morning and afternoon trips through Oct. 24, Thereafter check the website for scheduled departures; the cog railway is now open year round but not daily in the off-season. Rio Grande Scenic Railway – Departing from Alamosa and LaVeta the Rio Grande Scenic Railway gives passengers multiple trip options (distance, time and price) including a visit to Great Sand Dunes National Park. The autumn schedule includes Rails and Ales Oktoberfest Oct. 2, 2010 complete with brats, ales and oompa band music and a Pumpkin Patch Ride Oct. 23, 2010. “Golden Ticket” senior discounts during September and October allow passengers 65+ to purchase one senior ticket and get one free. Does not apply to special event trains. Amtrak – Passenger service between Chicago and the West Coast traverses the Colorado Rockies west of Denver. The route through the Moffat Tunnel, Grand County and along the Colorado River offers superb scenery. Trips from Denver to Glenwood Springs or Grand Junction offer getaways without driving busy I-70. Nancy’s Caveat – One shouldn’t have a tight schedule when traveling via Amtrak, delays can and do occur – especially the east bound trains. Colorado Railroad Museum – Located west of downtown Denver in Golden, the museum houses a large collection of rolling stock and railroad memorabilia. Youngster love the yearly Day Out with Thomas (The Tank Engine scheduled for September 18, 19, 25 & 26, 2010 – reserved admission tickets required. The seasonal Trick or Treat Train will operate October 30 & 31. Tiny Town – In the foothills just off US285, Tiny Town attracts the pre-school set to the oldest kid-sized village and railroad in the United States. The miniature railroad, powered by coal-fired locomotives, loops through the village of more than 100 buildings and along the hillsides of Turkey Creek Canyon. After riding the train, investigate the 1/6-scale structures handcrafted by volunteers; be sure to peek into windows and skylights. A playground and picnic area encourages families to linger. Open weekends, 10am-5pm, during September. Billows of smoke, hissing steam and haunting echoes of the whistle signals the departure of each train out of the Durango & Silverton Narrow Gauge Railroad station. Yearly, up to 200,000 passengers board the historic train for the 45-mile scenic journey through the San Juan Mountains of southwestern Colorado. Founded by the Denver & Rio Grande Railway in 1879, Durango continues to rely on the railroad as a major economic force. The spur to Silverton opened in 1882 carrying freight and passengers to the mining community, returning with over three hundred million dollars in precious metals. Today, after 126 years of continuous operation, tourists are the valuable cargo. Rail buffs from around the world make Durango a prime destination. Coal-fired steam engines pull an assortment of vintage rolling stock from city to wilderness. Standard fare riders choose between open-air gondola cars or vintage coaches. A variety of premium classes adds more comfort and amenities for the 3½-hour, one-way journey. The dramatic scenery of rugged peaks, waterfalls, cliffs high above the Animas River and wildlife thrills all passengers. Legend holds that founder of the Denver & Rio Grande, General William Jackson Palmer, implemented narrow gauge because he wanted to prevent men and women from being able to sleep in the same bed on the train. The narrow cars only had room for single sleeper bunks on each side. With rails set 36 inches apart, compared to 56.5 for standard gauge, narrow gauge was less expensive to build and ideal for mountain terrain with sharper curves, steeper grades and narrow ledges. Arrival in Silverton seems a step-back to the days of the Old West. The entire town is a designat ed National Historic Landmark reminiscent of a Western movie set; false-front emporiums, ornate Victorian hotels, wagons and stagecoaches traveling the dusty streets. Rail passengers have a two hour lay over, time for lunch and a walk around town. Some choose to overnight in Silverton- allowing time for jeep and mine tours or a high country hike. Reservations can also be made for a one-way rail trip with return by bus, a practical choice for younger children or those unable to devote an entire day to train travel averaging 18 miles-per-hour. 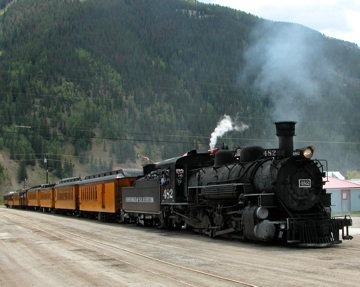 Cumbres and Toltec Scenic Railroad – This popular excursion weaves along the Colorado/New Mexico border. Special fall events include the Fall Foliage Photo Train on Sept. 27, Galloping Goose Fall Colors Train Oct. 1-4, Chama Moonlight Dinner Train Oct. 2, Fall Foliage Sunday Express Oct. 4 and Chama Steam Fall Classic Oct 24. 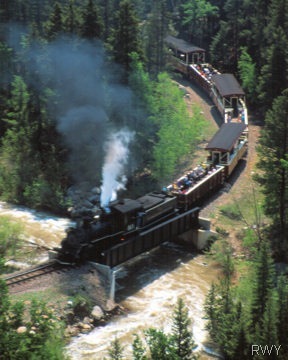 Durango and Silverton Narrow Gauge Railroad – Passengers step back more than a century when they board this historic train that has operated continuously since 1882. The route through Colorado’s San Juan Mountains offers unparalleled scenery. Autumn specials include the 20th Annual Fall Photo Special & Night Photo Shoot Sept. 26-27, Cowboy Poet Train/Durango Cowboy Gathering Oct. 2, Durango Heritage Train Oct. 10, and Peanuts The Great Pumpkin Patch Express Oct. 10, 11, 17, 18, 24, 25 & 31. Reservations a must! 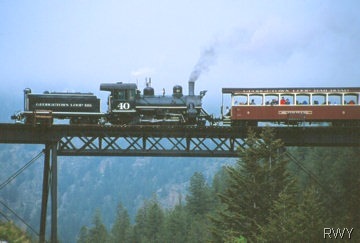 Manitou and Pikes Peak Railway – Scales Pikes Peak on the world’s highest cog railroad. The three-hour round trip to the 14,110’ summit qualifies as the most relaxed climb up the well-known mountain. Swiss diesel locomotives ratchet bright red cars filled with tourists up slopes with grades as high as 25%. Morning and afternoon trips through Oct. 25, thereafter check the website for scheduled departures. Rio Grande Scenic Railway – Departing from Alamosa and LaVeta the Rio Grande Scenic Railway gives passengers multiple trip op tions (distance, time and price) including a visit to Great Sand Dunes National Park. The autumn schedule includes Rails and Ales Oktoberfest Oct. 3, Fiesta Train Oct. 10 and Pumpkin Patch Ride Oct. 24 and 31. A combined rail adventure and Michael Martin Murphey’s Mountain Music Show occurs September 19. Amtrak – Passenger service between Chicago and the West Coast traverses the Colorado Rockies west of Denver. The route through the Moffat Tunnel, Grand County and along the Colorado River offers superb scenery. Trips from Denver to Glenwood Springs or Grand Junction offer getaways without driving busy I-70. Nancy’s Caveat – One shouldn’t have a tight schedule when traveling via Amtrak, delays can and do occur – especially east bound trains. The most convenient scenic railroad for Denver area residents also stands as one of the state’s great engineering feats. The historic narrow gauge Georgetown Loop recreates the dramatic climb from Georgetown to Silver Plume, both established as important silver mining regions in the 1860s. Success of the mines depended on reliable rail lines between Denver and the mining camps. By 1877, a route was completed through Golden and Idaho Springs to Georgetown. There, engineers and construction crews faced a daunting challenge. Silver Plume, just two miles away, was 600-feet higher in elevation – up a narrow, steep canyon. The resulting six-percent grade would prove too great for most locomotives. The solution included more than four miles of track and multiple bridges including the Devil’s Gate High Bridge rising 95-feet above Clear Creek. The first passenger train arrived in Silver Plume in April 1884, beginning a boom in tourism for one-day excursions from Denver. Abandoned by the late 1930s, the track and bridges were dismantled. The Colorado Historical Society, assisted by a major grant from the Boettcher Foundation, spent more than ten years reconstructing the roadbed, laying track and rebuilding the Devil’s Gate High Bridge. Dedication of the new facilities occurred 100 years after the original completion. Today an oil-powered steam locomotive exhales deep, throaty chugs as it pulls passenger cars up the scenic canyon. Soon the rhythm recalls the children’s book words, “I think I can, I think I can, I think I can.” Trainman, Ron Ruhoff, willingly answers questions and interprets whistle signals; three toots for going backwards, a long and a short when approaching a trestle. During the summer months, until Labor Day, a tour of the Lebanon Silver Mine offers an added attraction. Accessible only by train, the guided underground excursion conveys tales of hard rock miners’ difficult lives. *Article by Nancy Yackel, first published in Buzz in the ‘burbs, a suburban Denver monthly lifestyle magazine. As soon as the conductor calls, “All aboard,” waiting passengers eagerly make their seat selections on the Cripple Creek and Victor Narrow Gauge Railroad. Some head towards the front car to observe the crew shoveling coal into the steam engine while others are drawn to the rear to watch the receding rails. The popularity of open or closed cars depends on weather conditions. Choose wisely, there is no way to move between cars dur ing the 45-minute trip. The train follows the old Midland-Terminal roadbed, crosses a reconstructed trestle and passes gold mine sites with lively histories. Stands of aspen frame postcard worthy views of the Sangre de Cristo Mountains. On an uphill grade the train slows to a mere crawl before restoking provides a burst of steam power accented by pillaring black smoke. Passengers may encounter soot or tiny coal embers; wearing white is not a wise choice. Narration along the route relates a time when the rich Cripple Creek and Victor gold mining districts supported a population of nearly 50,000 and served as the economic and social hub of the region. At the turn of the 20th century ladies from Colorado Springs rode the Midland train to Cripple Creek in order to shop for the latest fashions. The May Company opened their second department store here during those boom days. Long draws on the steam whistle demonstrate how Echo Valley earned its name. Numerous reverberations work their way down valley with each toot. Returning to Cripple Creek passengers find a gift shop filled with railroad themed items, including lots of ‘Thomas the Tank’ gear, and an array of local history books. 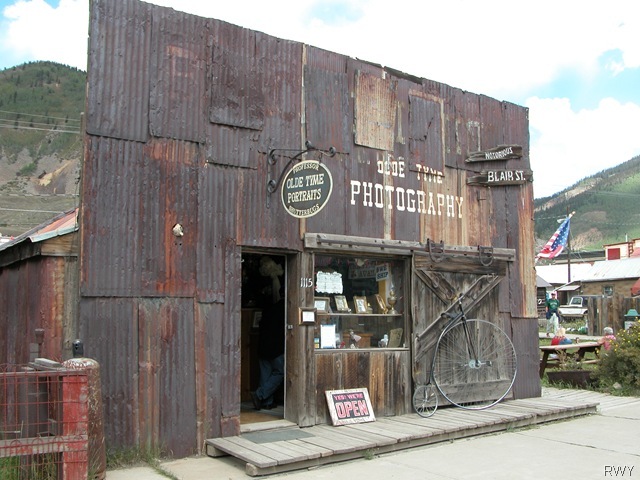 Next door, check out the Cripple Creek District Museum in the original Midland-Terminal Depot. 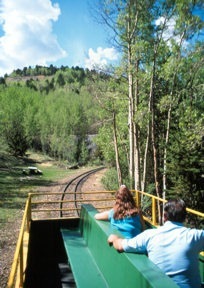 The 4-mile round trip aboard the colorful Cripple Creek & Victor Narrow Gauge Railroad is a great choice for families with small children or adults with short attention spans. 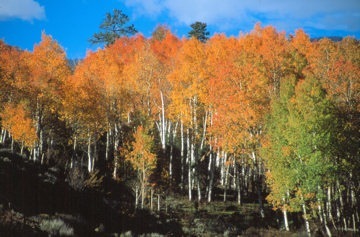 Plentiful aspen groves add autumn color and photographic highlights. Fifteen minutes after leaving the Leadville depot the debris of civilization disappears and tall white aspen trunks support a golden canopy above the Leadville, Colorado and Southern train. The Continental Divide and Colorado’s highest mountains cap the westward vista. “Tickets,” calls Liz as she enters each car of the standard gauge, diesel-powered train. The gregarious conductor is in her 13th year welcoming passengers to the scenic trip towards Fremont Pass. Rows of seats run the length of the cars providing unobstructed viewing. From one side riders watch the headwaters of the Arkansas River snake through the valley below; while, those on the other side scan the hillside for marmots, deer and trickling waterfalls. 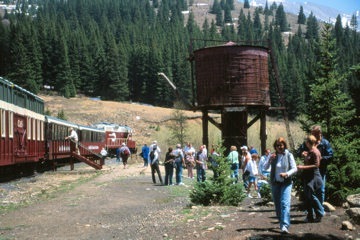 A 15-minute stop at the French Gulch Water Tank allows passengers to investigate nearby French Creek, take photographs or check out the historic 47,500-gallon water tank. The crew opens the caboose for inspection and encourages climbing into the cupola. The once traditional last car of freight trains has become a rarity. The Leadville, Colorado & Southern not only uses a caboose, they allow two riders (for an additional fee) on the return trip into Leadville. Relaxed in leather armchairs high in the cupola, caboose passengers travel at tree top level with unparalleled views of the train and route ahead. 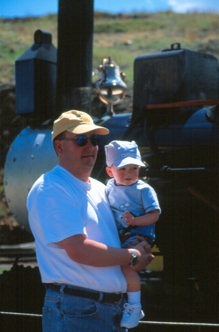 This unique experience makes a great gift for rail buffs or to share with a grandchild. Reserve caboose rides when you make reservations. Also inquire about rides in the locomotive. Rail travel and one of Colorado’s most popular destinations combine for an outstanding adventure. The Royal Gorge Route threads through the famous canyon 1,000 feet below the world’s highest suspension bridge. Twisting along the banks of the Arkansas River, trips aboard this train promise close-up views of the Arkansas River, wildlife and sheer granite walls. Two-hour trips depart from the historic Santa Fe Depot in Cañon City; traveling 12 miles to Parkdale before reversing direction. A stop on Hanging Bridge highlights each trip; the canyon narrows at this point so much that the rails are suspended over the river. During the season, passengers watch rafters tackle the surging waters of Class V rapids. Views upward include a swath of Colorado sky and the thin ribbon of the Royal Gorge Bridge linking perpendicular canyon walls. The streamline train consists of restored climate controlled coaches and roofless observation cars. The Sunshine Falls café and bar car satisfies hunger pangs. The Theodore Roosevelt dining car debuted on the route this summer, adding an upgrade option. During day trips First Class seating at comfortable tables includes a class of complimentary champagne or sparkling cider, chef’s choice of hor’s dourves and a cash bar. A local Cañon City company re-outfitted the Via Rail car in rich wood paneling, sparkling light fixtures and burgundy upholstery. For Colorado’s classiest rail trip make reservations on the Saturday night Twilight Dinner Train, offered through Oct.25th. Upon boarding, guests find an appetizer plate and champagne at their table. A chilled salad topped with homemade Bleu cheese dressing and crisp croutons is served soon after departure. Between courses diners step out to an observation car for sunset photos or stars sprinkled across the night sky canvas. Entrée choices are salmon with herbed wild rice and fresh vegetable or a generous roast prime rib served with baked potato and vegetables. Chocolate cake or cheesecake desserts and coffee conclude the four-course meal from chef Donovan McDonald and cheerful staff. The Royal Gorge Route continues operations on weekends during the winter and spring months, a boost to off-season tourists and residents. *Article by Nancy Yackel, first published September 2003 in Buzz in the ‘burbs, a suburban Denver monthly lifestyle magazine. Menu details, personnel and dates may have changed, check the Royal Gorge Route website for current details.